Liraglutide, one of the components of XULTOPHY 100/3.6, causes dose-dependent and treatment-duration-dependent thyroid C-cell tumors at clinically relevant exposures in both genders of rats and mice. It is unknown whether XULTOPHY 100/3.6 causes thyroid C-cell tumors, including medullary thyroid carcinoma (MTC), in humans, as the human relevance of liraglutide-induced rodent thyroid C-cell tumors has not been determined [see Warnings and Precautions ( 5.1 ) and Nonclinical Toxicology (13)]. XULTOPHY 100/3.6 is contraindicated in patients with a personal or family history of MTC and in patients with Multiple Endocrine Neoplasia syndrome type 2 (MEN 2). Counsel patients regarding the potential risk for MTC with the use of XULTOPHY 100/3.6 and inform them of symptoms of thyroid tumors (e.g. a mass in the neck, dysphagia, dyspnea, persistent hoarseness). Routine monitoring of serum calcitonin or using thyroid ultrasound is of uncertain value for early detection of MTC in patients treated with XULTOPHY 100/3.6 [see Contraindications (4), Warnings and Precautions (5.1)]. These highlights do not include all the information needed to use XULTOPHY 100/3.6 safely and effectively. See full prescribing information for XULTOPHY 100/3.6. Liraglutide, one of the components of XULTOPHY 100/3.6, causes thyroid C-cell tumors at clinically relevant exposures in both genders of rats and mice. It is unknown whether XULTOPHY 100/3.6 causes thyroid C-cell tumors, including medullary thyroid carcinoma (MTC), in humans, as the human relevance of liraglutide-induced rodent thyroid C-cell tumors has not been determined (5.1, 13.1). XULTOPHY 100/3.6 is contraindicated in patients with a personal or family history of MTC or in patients with Multiple Endocrine Neoplasia syndrome type 2 (MEN 2). Counsel patients regarding the potential risk of MTC and the symptoms of thyroid tumors (4, 5.1). XULTOPHY 100/3.6 is a combination of insulin degludec, a long-acting human insulin analog, and liraglutide, a glucagon-like peptide 1 (GLP-1) receptor agonist, indicated as an adjunct to diet and exercise to improve glycemic control in adults with type 2 diabetes mellitus. Not recommended for use in combination with any other product containing liraglutide or another GLP-1 receptor agonist. Discontinue therapy with liraglutide or basal insulin prior to initiation of XULTOPHY 100/3.6 ( 2.2). Recommended starting dose in patients naïve to basal insulin or GLP-1 receptor agonist is 10 units (10 units of insulin degludec and 0.36 mg of liraglutide) given subcutaneously once-daily (2.2). Recommended starting dose in patients currently on basal insulin or GLP-1 receptor agonist is 16 units (16 units of insulin degludec and 0.58 mg of liraglutide) given subcutaneously once-daily ( 2.2). Administer once daily at same time each day with or without food ( 2.1). Maximum daily dosage is 50 units (50 units of insulin degludec and 1.8 mg of liraglutide) ( 2.1). XULTOPHY 100/3.6 pen delivers doses from 10 to 50 units with each injection (2.1, 2.2); each XULTOPHY 100/3.6 dosage unit contains 1 unit of insulin degludec and 0.036 mg of liraglutide ( 2.1). See Full Prescribing Information for titration recommendations ( 2.3). Inject subcutaneously in thigh, upper arm or abdomen ( 2.5). Do not administer intravenously, intramuscularly, or by an infusion pump ( 2.5). Do not dilute or mix with any other insulin products or solutions ( 2.5). Injection: 100 units of insulin degludec per mL and 3.6 mg of liraglutide per mL in a 3 mL single-patient-use pen (3). Patients with a personal or family history of medullary thyroid carcinoma or in patients with Multiple Endocrine Neoplasia syndrome type 2 ( 4). During episodes of hypoglycemia ( 4). Patients with a prior serious hypersensitivity reaction to XULTOPHY 100/3.6 or either of the active substances or any of its excipients ( 4). Thyroid C-cell Tumors: See Boxed Warning ( 5.1). Pancreatitis: Postmarketing reports, including fatal and non-fatal hemorrhagic or necrotizing pancreatitis have been reported for liraglutide. Discontinue promptly if pancreatitis is suspected ( 5.2). Never share a XULTOPHY 100/3.6 pen between patients, even if the needle is changed ( 5.3). Hyper- or hypoglycemia with changes in XULTOPHY 100/3.6 regimen: Carry out under close medical supervision and increase frequency of blood glucose monitoring ( 5.4). Overdose due to medication errors: XULTOPHY 100/3.6 contains two drugs. Instruct patients to check label before injection since accidental mix-ups with insulin containing products can occur. Do not exceed the maximum dose or administer with other GLP-1 receptor agonists ( 5.5). Hypoglycemia: May be life-threatening. Increase monitoring with changes to: dosage, co-administered glucose lowering medications, meal pattern, physical activity; and in patients with renal impairment or hepatic impairment or hypoglycemia unawareness ( 5.6, 6.1). Acute Kidney Injury: Has been reported postmarketing for liraglutide, usually in association with nausea, vomiting, diarrhea, or dehydration, which may sometimes require hemodialysis. Advise patients of the potential risk of dehydration due to gastrointestinal adverse reactions and take precautions to avoid fluid depletion ( 5.7). Hypersensitivity and Allergic Reactions: Severe, life-threatening, generalized allergy, including anaphylaxis, angioedema, bronchospasm, hypotension, and shock can occur. If a hypersensitivity reaction occurs, discontinue and treat per standard of care ( 5.8). Acute Gallbladder Disease: If cholelithiasis or cholecystitis are suspected, gallbladder studies are indicated ( 5.9). Hypokalemia: May be life-threatening. Monitor potassium levels in patients at risk for hypokalemia and treat if indicated ( 5.10). Fluid retention and congestive heart failure with use of thiazolidinediones (TZDs): Observe for signs and symptoms of heart failure; consider dosage reduction or discontinuation if heart failure occurs ( 5.11). The most common adverse reactions, reported in ≥5% of patients treated with XULTOPHY 100/3.6: nasopharyngitis, headache, nausea, diarrhea, increased lipase and upper respiratory tract infection (6). 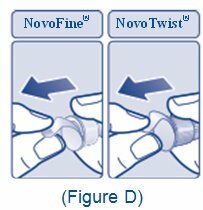 To report SUSPECTED ADVERSE REACTIONS, contact Novo Nordisk Inc. at 1-800-727-6500 or FDA at 1-800-FDA-1088 or www.fda.gov/medwatch. Drugs that affect glucose metabolism: Adjustment of XULTOPHY 100/3.6 dosage may be needed; closely monitor blood glucose ( 7.1). Anti-Adrenergic drugs (e.g., beta-blockers, clonidine, guanethidine, and reserpine): Hypoglycemia signs and symptoms may be reduced ( 7.1). Effects of delayed gastric emptying on oral medications: May impact absorption of concomitantly administered oral medications ( 7.2). Pregnancy: XULTOPHY 100/3.6 should be used during pregnancy only if the potential benefit justifies the potential risk to the fetus (8.1). XULTOPHY 100/3.6 is a combination of insulin degludec and liraglutide and is indicated as an adjunct to diet and exercise to improve glycemic control in adults with type 2 diabetes mellitus. XULTOPHY 100/3.6 is not recommended as first-line therapy for patients who have inadequate glycemic control on diet and exercise because of the uncertain relevance of the rodent C-cell tumor findings to humans [see Warnings and Precautions (5.1)]. XULTOPHY 100/3.6 is not recommended for use in combination with any other product containing liraglutide or another GLP-1 receptor agonist [see Warnings and Precautions (5.5)]. XULTOPHY 100/3.6 is not indicated for use in patients with type 1 diabetes mellitus or for the treatment of diabetic ketoacidosis. XULTOPHY 100/3.6 has not been studied in combination with prandial insulin. XULTOPHY 100/3.6 is a combination of insulin degludec and liraglutide. Administer XULTOPHY 100/3.6 by subcutaneous injection once-daily at the same time each day with or without food. The XULTOPHY 100/3.6 pen delivers doses from 10 to 50 units with each injection. Table 1 presents the units of insulin degludec and the milligrams of liraglutide in each dosage of XULTOPHY 100/3.6 [see Dosage and Administration (2.2)]. The maximum dose of XULTOPHY 100/3.6 is 50 units daily (50 units of insulin degludec and 1.8 mg of liraglutide) [see Warnings and Precautions (5.5)]. The recommended starting dose of XULTOPHY 100/3.6 is 10 units (10 units of insulin degludec and 0.36 mg of liraglutide) given subcutaneously once-daily (see Table 1). Discontinue therapy with basal insulin or liraglutide prior to initiation of XULTOPHY 100/3.6. The recommended starting dose of XULTOPHY 100/3.6 is 16 units (16 units of insulin degludec and 0.58 mg of liraglutide) given subcutaneously once-daily (see Table 1). * The dose counter on the XULTOPHY 100/3.6 pen displays numbers for the even units and displays lines for the odd units. After starting the recommended starting dose of XULTOPHY 100/3.6 [see Dosage and Administration (2.2)], titrate the dosage upwards or downwards by two units (see Table 2) every three to four days based on the patient’s metabolic needs, blood glucose monitoring results, and glycemic control goal until the desired fasting plasma glucose is achieved. To minimize the risk of hypoglycemia or hyperglycemia, additional titration may be needed with changes in physical activity, meal patterns (i.e., macronutrient content or timing of food intake), or renal or hepatic function; during acute illness; or when used with other medications [see Warnings and Precautions (5.4) and Drug Interactions (7)]. Instruct patients who miss a dose of XULTOPHY 100/3.6 to resume the once-daily regimen as prescribed with the next scheduled dose. Do not administer an extra dose or increase the dose to make up for the missed dose. If more than three days have elapsed since the last XULTOPHY 100/3.6 dose, reinitiate XULTOPHY 100/3.6 at the recommended starting dose to mitigate any gastrointestinal symptoms associated with reinitiation of treatment [see Dosage and Administration (2.1, 2.2, 2.3)]. The XULTOPHY 100/3.6 pen is for single-patient-use only [see Warnings and Precautions (5.3)]. Train patients on proper use and injection technique before initiating XULTOPHY 100/3.6. Always check the label on the XULTOPHY 100/3.6 pen before administration [see Warnings and Precautions (5.5)]. Inspect visually for particulate matter and discoloration prior to administration. Only use XULTOPHY 100/3.6 if the solution appears clear and colorless. Inject XULTOPHY 100/3.6 subcutaneously into the thigh, upper arm, or abdomen. Use XULTOPHY 100/3.6 with caution in patients with visual impairment who may rely on audible clicks to dial their dose. The XULTOPHY 100/3.6 pen dials in one-unit increments. 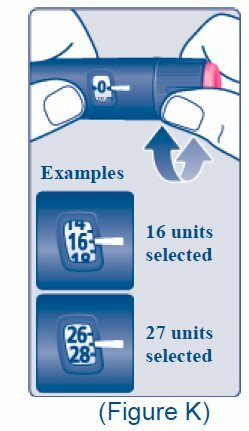 Do not administer XULTOPHY 100/3.6 intravenously, intramuscularly, or in an insulin infusion pump. Do not dilute or mix XULTOPHY 100/3.6 with any other insulin products or solutions. Do not split the dose of XULTOPHY 100/3.6. XULTOPHY 100/3.6 injection: 100 units insulin degludec per mL and 3.6 mg liraglutide per mL available as a clear, colorless solution in a 3 mL pre-filled, disposable, single-patient-use pen injector. In patients with a personal or family history of medullary thyroid carcinoma (MTC) or in patients with Multiple Endocrine Neoplasia syndrome type 2 (MEN 2) [see Warnings and Precautions (5.1)]. During episodes of hypoglycemia [see Warnings and Precautions (5.6)]. In patients with hypersensitivity to XULTOPHY 100/3.6, either insulin degludec or liraglutide, or any of its excipients. Serious hypersensitivity reactions including anaphylactic reactions and angioedema have been reported with liraglutide, one of the components of XULTOPHY 100/3.6 [see Warnings and Precautions (5.8)]. Liraglutide, one of the components of XULTOPHY 100/3.6, causes dose-dependent and treatment-duration-dependent thyroid C-cell tumors (adenomas and/or carcinomas) at clinically relevant exposures in both genders of rats and mice [see Nonclinical Toxicology (13.1)]. Malignant thyroid C-cell carcinomas were detected in rats and mice. It is unknown whether XULTOPHY 100/3.6 will cause thyroid C-cell tumors, including medullary thyroid carcinoma (MTC), in humans, as the human relevance of liraglutide-induced rodent thyroid C-cell tumors has not been determined. Cases of MTC in patients treated with liraglutide have been reported in the postmarketing period; the data in these reports are insufficient to establish or exclude a causal relationship between MTC and liraglutide use in humans. XULTOPHY 100/3.6 is contraindicated in patients with a personal or family history of MTC or in patients with MEN 2. Counsel patients regarding the potential risk for MTC with the use of XULTOPHY 100/3.6 and inform them of symptoms of thyroid tumors (e.g. a mass in the neck, dysphagia, dyspnea, persistent hoarseness). Routine monitoring of serum calcitonin or using thyroid ultrasound is of uncertain value for early detection of MTC in patients treated with XULTOPHY 100/3.6. Such monitoring may increase the risk of unnecessary procedures, due to low test specificity for serum calcitonin and a high background incidence of thyroid disease. Significantly elevated serum calcitonin may indicate MTC and patients with MTC usually have calcitonin values >50 ng/L. If serum calcitonin is measured and found to be elevated, the patient should be further evaluated. Patients with thyroid nodules noted on physical examination or neck imaging should also be further evaluated. Based on spontaneous postmarketing reports, acute pancreatitis, including fatal and non-fatal hemorrhagic or necrotizing pancreatitis, has been observed in patients treated with liraglutide, one of the components of XULTOPHY 100/3.6. In glycemic control trials of liraglutide, there have been 13 cases of pancreatitis among liraglutide-treated patients and 1 case in a comparator (glimepiride) treated patient (2.7 vs. 0.5 cases per 1000 patient-years). Nine of the 13 cases with liraglutide were reported as acute pancreatitis and four were reported as chronic pancreatitis. In one case in a liraglutide-treated patient, pancreatitis, with necrosis, was observed and led to death; however clinical causality could not be established. Some patients had other risk factors for pancreatitis, such as a history of cholelithiasis or alcohol abuse. After initiation of XULTOPHY 100/3.6, observe patients carefully for signs and symptoms of pancreatitis (including persistent severe abdominal pain, sometimes radiating to the back and which may or may not be accompanied by vomiting). If pancreatitis is suspected, XULTOPHY 100/3.6 should promptly be discontinued and appropriate management should be initiated. If pancreatitis is confirmed, restarting XULTOPHY 100/3.6 is not recommended. Liraglutide, one of the components of XULTOPHY 100/3.6, has been studied in a limited number of patients with a history of pancreatitis. It is unknown if patients with a history of pancreatitis are at higher risk for development of pancreatitis on liraglutide. XULTOPHY 100/3.6 pen must never be shared between patients, even if the needle is changed. Sharing of the pen poses a risk for transmission of blood-borne pathogens. Changes in XULTOPHY 100/3.6 regimen may affect glycemic control and predispose to hypoglycemia or hyperglycemia [see Warnings and Precautions (5.5)]. These changes should be made cautiously and only under medical supervision and the frequency of blood glucose monitoring should be increased. Adjustments in concomitant oral anti-diabetic treatment may be needed. When initiating XULTOPHY 100/3.6, follow dosing recommendations [see Dosage and Administration (2.1,2.2, 2.3)]. XULTOPHY 100/3.6 contains two drugs: insulin degludec and liraglutide. Administration of more than 50 units of XULTOPHY 100/3.6 daily can result in overdose of the liraglutide component. Do not exceed the 1.8 mg maximum recommended dose of liraglutide or use with other glucagon-like peptide-1 receptor agonists. Accidental mix-ups between insulin products have been reported. To avoid medication errors between XULTOPHY 100/3.6 (an insulin containing product) and other insulin products, instruct patients to always check the label before each injection. Hypoglycemia is the most common adverse reaction of insulin containing products, including XULTOPHY 100/3.6 [see Adverse Reactions (6.1)]. Severe hypoglycemia can cause seizures, may be life-threatening or cause death. Hypoglycemia can impair concentration ability and reaction time; this may place an individual and others at risk in situations where these abilities are important (e.g., driving or operating other machinery). XULTOPHY 100/3.6 (an insulin-containing product) or any insulin, should not be used during episodes of hypoglycemia [seeContraindications (4)]. Hypoglycemia can happen suddenly and symptoms may differ in each individual and change over time in the same individual. Symptomatic awareness of hypoglycemia may be less pronounced in patients with longstanding diabetes, in patients with diabetic nerve disease, in patients using medications that block the sympathetic nervous system (e.g., beta-blockers) [seeDrug Interactions (7.1)], or in patients who experience recurrent hypoglycemia. The risk of hypoglycemia generally increases with intensity of glycemic control. The risk of hypoglycemia after an injection is related to the duration of action of the insulin [seeClinical Pharmacology (12.2)] and, in general, is highest when the glucose lowering effect of the insulin is maximal. As with all insulin containing products, the glucose lowering effect time course of XULTOPHY 100/3.6 may vary among different individuals or at different times in the same individual and depends on many conditions, including the area of injection as well as the injection site blood supply and temperature. Other factors which may increase the risk of hypoglycemia include changes in meal pattern (e.g., macronutrient content or timing of meals), changes in level of physical activity, or changes to co-administered medication [see Drug Interactions (7.1)]. Patients with renal or hepatic impairment may be at higher risk of hypoglycemia [see Use in Specific Populations(8.6, 8.7)]. There have been postmarketing reports of acute renal failure and worsening of chronic renal failure, which may sometimes require hemodialysis in patients treated with liraglutide, one of the components of XULTOPHY 100/3.6 [see Adverse Reactions (6.3)]. Some of these events were reported in patients without known underlying renal disease. A majority of the reported events occurred in patients who had experienced nausea, vomiting, diarrhea, or dehydration. Some of the reported events occurred in patients receiving one or more medications known to affect renal function or hydration status. Altered renal function has been reversed in many of the reported cases with supportive treatment and discontinuation of potentially causative agents, including liraglutide. Advise patients of the potential risk of dehydration due to gastrointestinal adverse reactions and take precautions to avoid fluid depletion. Severe, life-threatening, generalized allergy, including anaphylaxis, angioedema, bronchospasm, hypotension, and shock can occur with XULTOPHY 100/3.6.Allergic reactions (manifested with signs and symptoms such as urticaria, rash, pruritus) have been reported with XULTOPHY 100/3.6. There have been postmarketing reports of serious hypersensitivity reactions (e.g., anaphylactic reactions and angioedema) in patients treated with liraglutide, one of the components of XULTOPHY 100/3.6 [see Adverse Reactions (6.3)]. If a hypersensitivity reaction occurs, discontinue XULTOPHY 100/3.6; treat promptly per standard of care, and monitor until signs and symptoms resolve. Anaphylaxis and angioedema have been reported with other GLP-1 receptor agonists. Use caution in a patient with a history of anaphylaxis or angioedema with another GLP-1 receptor agonist because it is unknown whether such patients will be predisposed to these reactions with XULTOPHY 100/3.6. XULTOPHY 100/3.6 is contraindicated in patients who have had hypersensitivity reactions to insulin degludec, liraglutide or one of the excipients of these products [see Contraindications (4)]. In a cardiovascular outcomes trial (LEADER trial) [see Clinical Studies (14.4)], 3.1% of patients treated with liraglutide, one of the components of XULTOPHY 100/3.6, versus 1.9% of placebo treated patients reported an acute event of gallbladder disease, such as cholelithiasis or cholecystitis. The majority of events required hospitalization or cholecystectomy. If cholelithiasis is suspected, gallbladder studies and appropriate clinical follow-up are indicated. All insulin-containing products, including XULTOPHY 100/3.6, cause a shift in potassium from the extracellular to intracellular space, possibly leading to hypokalemia. Untreated hypokalemia may cause respiratory paralysis, ventricular arrhythmia, and death. Monitor potassium levels in patients at risk for hypokalemia if indicated (e.g., patients using potassium-lowering medications, patients taking medications sensitive to serum potassium concentrations). Thiazolidinediones (TZDs), which are peroxisome proliferator-activated receptor (PPAR)-gamma agonists can cause dose related fluid retention, particularly when used in combination with insulin containing products, including XULTOPHY 100/3.6. Fluid retention may lead to or exacerbate congestive heart failure. Patients treated with insulin containing products, including XULTOPHY 100/3.6 and a PPAR-gamma agonist should be observed for signs and symptoms of congestive heart failure. If congestive heart failure develops, it should be managed according to current standards of care and discontinuation or dose reduction of the PPAR-gamma agonist must be considered. The data in Table 3 reflect the exposure of 1881 patients to XULTOPHY 100/3.6 and a mean duration of exposure of 33 weeks. The mean age was 57 years and 2.8% were older than 75 years; 52.6% were male, 75.0% were White, 6.2% were Black or African American and 15.9% were Hispanic or Latino. The mean body mass index (BMI) was 31.8 kg/m2. The mean duration of diabetes was 8.7 years and the mean HbA1c at baseline was 8.2%. A history of neuropathy, ophthalmopathy, nephropathy and cardiovascular disease at baseline was reported in 25.4%, 12.0%, 6.5% and 6.3% respectively. The mean eGFR at baseline was 88.3 mL/min/1.73 m2 and 6.24% of the patients had an eGFR less than 60 mL/min/1.73 m2. Hypoglycemia is the most commonly observed adverse reaction in patients using insulin and insulin containing products, including XULTOPHY 100/3.6 [see Warnings and Precautions (5.6)]. The number of reported hypoglycemia episodes depends on the definition of hypoglycemia used, insulin dose, intensity of glucose control, background therapies, and other intrinsic and extrinsic patient factors. For these reasons, comparing rates of hypoglycemia in clinical trials for XULTOPHY 100/3.6 with the incidence of hypoglycemia for other products may be misleading and also, may not be representative of hypoglycemia rates that will occur in clinical practice. In the phase 3 clinical program [see Clinical Studies (14)], events of severe hypoglycemia were defined as an episode requiring assistance of another person to actively administer carbohydrate, glucagon, or other resuscitative actions (Table 4). Hypoglycemia episodes with a glucose level below 54 mg/dL associated with or without symptoms is shown in Table 4. No clinically important differences in risk of severe hypoglycemia between XULTOPHY 100/3.6 and comparators were observed in clinical trials. † episode requiring assistance of another person to actively administer carbohydrate, glucagon, or other resuscitative actions. *Episodes of hypoglycemia with a glucose level below 54 mg/dL that are associated with or without symptoms of hypoglycemia. Gastrointestinal adverse reactions including nausea, diarrhea, vomiting, constipation, dyspepsia, gastritis, abdominal pain, flatulence, eructation, gastroesophageal reflux disease, abdominal distension and decreased appetite have been reported in patients treated with XULTOPHY 100/3.6. Gastrointestinal adverse reactions may occur more frequently at the beginning of XULTOPHY 100/3.6 therapy and diminish within a few days or weeks on continued treatment. In glycemic control trials of liraglutide, there were 7 reported cases of papillary thyroid carcinoma in patients treated with liraglutide and 1 case in a comparator-treated patient (1.5 vs. 0.5 cases per 1000 patient years). Most of these papillary thyroid carcinomas were <1 cm in greatest diameter and were diagnosed in surgical pathology specimens after thyroidectomy prompted by findings on protocol-specified screening with serum calcitonin or thyroid ultrasound. In glycemic control trials of liraglutide, the incidence of cholelithiasis was 0.3% in both liraglutide-treated and placebo-treated patients. The incidence of cholecystitis was 0.2% in both liraglutide treated and placebo-treated patients. In a cardiovascular outcomes trial (LEADER trial) [see Clinical Studies (14.4)], the incidence of cholelithiasis was 1.5% (3.9 cases per 1000 patient years of observation) in liraglutide-treated and 1.1% (2.8 cases per 1000 patient years of observation) in placebo-treated patients, both on a background of standard of care. The incidence of acute cholecystitis was 1.1% (2.9 cases per 1000 patient years of observation) in liraglutide-treated and 0.7% (1.9 cases per 1000 patient years of observation) in placebo-treated patients. Long-term use of insulin containing products, including XULTOPHY 100/3.6, can cause lipodystrophy at the site of repeated injections. Lipodystrophy includes lipohypertrophy (thickening of adipose tissue) and lipoatrophy (thinning of adipose tissue), and may affect absorption [see Dosage and Administration (2.5)]. Insulin containing products, including XULTOPHY 100/3.6, may cause sodium retention and edema, particularly if previously poor metabolic control is improved rapidly by intensified therapy. Weight gain can occur with insulin containing products, including XULTOPHY 100/3.6, and has been attributed to the anabolic effects of insulin. In study A, after 26 weeks of treatment, patients converting to XULTOPHY 100/3.6 from liraglutide had a mean increase in body weight of 2 kg. As with any insulin and GLP-1 receptor agonist-containing products, patients taking XULTOPHY 100/3.6 may experience injection site reactions, including injection site hematoma, pain, hemorrhage, erythema, nodules, swelling, discoloration, pruritis, warmth, and injection site mass. In the clinical program, the proportion of injection site reactions occurring in patients treated with XULTOPHY 100/3.6 was 2.6%. These reactions were usually mild and transitory and they normally disappear during continued treatment. Severe, life-threatening, generalized allergy, including anaphylaxis, generalized skin reactions, angioedema, bronchospasm, hypotension, and shock may occur with any insulin-containing products including XULTOPHY 100/3.6 and may be life threatening [see Warnings and Precautions (5.8)]. Hypersensitivity (manifested with swelling of tongue and lips, diarrhea, nausea, tiredness, and itching) and urticaria were reported. In the five glycemic control trials of at least 26 weeks duration, mildly elevated serum bilirubin concentrations (elevations to no more than twice the upper limit of the reference range) occurred in 4.0% of liraglutide-treated patients, 2.1% of placebo-treated patients and 3.5% of active-comparator-treated patients. This finding was not accompanied by abnormalities in other liver tests. The significance of this isolated finding is unknown. Calcitonin, a biological marker of MTC, was measured throughout the XULTOPHY 100/3.6 clinical development program. Among patients with pretreatment calcitonin <20 ng/L, calcitonin elevations to >20 ng/L occurred in 0.7% of XULTOPHY 100/3.6-treated patients, 0.7% of placebo-treated patients, and 1.1% and 0.7% of active-comparator-treated patients (basal insulins and GLP-1s respectively). The clinical significance of these findings is unknown. Calcitonin, a biological marker of MTC, was measured throughout the liraglutide clinical development program. At the end of the glycemic control trials, adjusted mean serum calcitonin concentrations were higher in liraglutide-treated patients compared to placebo-treated patients but not compared to patients receiving active comparator. Between group differences in adjusted mean serum calcitonin values were approximately 0.1 ng/L or less. Among patients with pretreatment calcitonin <20 ng/L, calcitonin elevations to >20 ng/L occurred in 0.7% of liraglutide-treated patients, 0.3% of placebo-treated patients, and 0.5% of active-comparator-treated patients. The clinical significance of these findings is unknown. In one glycemic control trial in renal impairment patients, a mean increase of 33% for lipase and 15% for amylase from baseline was observed for liraglutide-treated patients while placebo-treated patients had a mean decrease in lipase of 3% and a mean increase in amylase of 1%. In a cardiovascular outcomes trial (LEADER trial) [see Clinical Studies (14.4)], serum lipase and amylase were routinely measured. Among liraglutide-treated patients, 7.9% had a lipase value at any time during treatment of greater than or equal to 3 times the upper limit of normal compared with 4.5% of placebo-treated patients, and 1% of liraglutide-treated patients had an amylase value at any time during treatment of greater than or equal to 3 times the upper limit of normal versus 0.7% of placebo-treated patients. The clinical significance of elevations in lipase or amylase with liraglutide is unknown in the absence of other signs and symptoms of pancreatitis [see Warnings and Precautions (5.2)]. Mean increases from baseline in heart rate of 2 to 3 beats per minute have been observed with XULTOPHY 100/3.6 which is attributable to the liraglutide component. As with all therapeutic proteins, there is potential for immunogenicity. The detection of antibody formation is highly dependent on the sensitivity and specificity of the assay. Additionally, the observed incidence of antibody (including neutralizing antibody) positivity in an assay may be influenced by several factors including assay methodology, sample handling, timing of sample collection, concomitant medications, and underlying disease. For these reasons, comparison of the incidence of antibodies to XULTOPHY 100/3.6 in the studies described below with the incidence of antibodies in other studies or to other products may be misleading. Administration of XULTOPHY 100/3.6 may cause formation of antibodies against insulin degludec and/or liraglutide. In rare cases, the presence of such antibodies may necessitate adjustment of the XULTOPHY 100/3.6 dose in order to correct a tendency to hyper- or hypoglycemia. In the clinical trials where antibodies were measured in patients receiving XULTOPHY 100/3.6, 11.1% of patients were positive for insulin degludec specific antibodies at end of treatment vs. 2.4% at baseline, 30.8% of patients were positive for antibodies cross-reacting with human insulin at end of treatment vs. 14.6% at baseline. 2.1% of patients were positive for anti-liraglutide antibodies at end of treatment (no patients were positive at baseline). Antibody formation has not been associated with reduced efficacy of XULTOPHY 100/3.6. Consistent with the potentially immunogenic properties of protein and peptide pharmaceuticals, patients treated with liraglutide may develop anti-liraglutide antibodies. The detection of antibody formation is highly dependent on the sensitivity and specificity of the assay. Additionally, the observed incidence of antibody (including neutralizing antibody) positivity in an assay may be influenced by several factors including assay methodology, sample handling, timing of sample collection, concomitant medications, and underlying disease. For these reasons, the incidence of antibodies to liraglutide cannot be directly compared with the incidence of antibodies of other products. Approximately 50-70% of liraglutide-treated patients in five double-blind clinical trials of 26 weeks duration or longer were tested for the presence of anti-liraglutide antibodies at the end of treatment. Low titers (concentrations not requiring dilution of serum) of anti-liraglutide antibodies were detected in 8.6% of these liraglutide-treated patients. Cross-reacting anti-liraglutide antibodies to native glucagon-like peptide-1 (GLP-1) occurred in 6.9% of the liraglutide-treated patients in the double-blind 52-week monotherapy trial and in 4.8% of the liraglutide-treated patients in the double-blind 26-week add-on combination therapy trials. These cross-reacting antibodies were not tested for neutralizing effect against native GLP-1, and thus the potential for clinically significant neutralization of native GLP-1 was not assessed. Antibodies that had a neutralizing effect on liraglutide in an in vitro assay occurred in 2.3% of the liraglutide-treated patients in the double-blind 52-week monotherapy trial and in 1.0% of the liraglutide-treated patients in the double-blind 26-week add-on combination therapy trials. Antibody formation was not associated with reduced efficacy of liraglutide when comparing mean HbA1c of all antibody-positive and all antibody-negative patients. However, the 3 patients with the highest titers of anti-liraglutide antibodies had no reduction in HbA1c with liraglutide treatment. In five double-blind glycemic control trials of liraglutide, events from a composite of adverse events potentially related to immunogenicity (e.g. urticaria, angioedema) occurred among 0.8% of liraglutide-treated patients and among 0.4% of comparator-treated patients. Urticaria accounted for approximately one-half of the events in this composite for liraglutide-treated patients. Patients who developed anti-liraglutide antibodies were not more likely to develop events from the immunogenicity events composite than were patients who did not develop anti-liraglutide antibodies. In a cardiovascular outcomes trial (LEADER trial) [see Clinical Studies (14.4)], anti-liraglutide antibodies were detected in 11 out of the 1247 (0.9%) liraglutide-treated patients with antibody measurements. Of the 11 liraglutide-treated patients who developed anti-liraglutide antibodies, none were observed to develop neutralizing antibodies to liraglutide, and 5 patients (0.4%) developed cross-reacting antibodies against native GLP-1. In a 52-week study of adult insulin-naïve type 2 diabetes patients, 1.7% of patients who received insulin degludec were positive at baseline for anti-insulin degludec antibodies and 6.2% of patients developed anti-insulin degludec antibodies at least once during the study. In these trials, between 96.7% and 99.7% of patients who were positive for anti-insulin degludec antibodies were also positive for anti-human insulin antibodies. The following additional adverse reactions have been reported during post-approval use. Because these events are reported voluntarily from a population of uncertain size, it is generally not possible to reliably estimate their frequency or establish a causal relationship to drug exposure. Dehydration resulting from nausea, vomiting and diarrhea. Increased serum creatinine, acute renal failure or worsening of chronic renal failure, sometimes requiring hemodialysis. A number of medications affect glucose metabolism and may require dose adjustment of XULTOPHY 100/3.6 and particularly close monitoring [see Dosage and Administration (2.2); Warnings and Precautions (5.6)]. Dose reductions and increased frequency of glucose monitoring may be required when XULTOPHY 100/3.6 is co-administered with these drugs. Atypical antipsychotics (e.g., olanzapine and clozapine), corticosteroids, danazol, diuretics, estrogens, glucagon, isoniazid, niacin, oral contraceptives, phenothiazines, progestogens (e.g., in oral contraceptives), protease inhibitors, somatropin, sympathomimetic agents (e.g., albuterol, epinephrine, terbutaline), and thyroid hormones. Dose increases and increased frequency of glucose monitoring may be required when XULTOPHY 100/3.6 is co-administered with these drugs. Alcohol, beta-blockers, clonidine, and lithium salts. Pentamidine may cause hypoglycemia, which may sometimes be followed by hyperglycemia. Dose adjustment and increased frequency of glucose monitoring may be required when XULTOPHY 100/3.6 is co-administered with these drugs. Increased frequency of glucose monitoring may be required when XULTOPHY 100/3.6 is co-administered with these drugs. Liraglutide-containing products, including XULTOPHY 100/3.6, cause a delay of gastric emptying, and thereby have the potential to impact the absorption of concomitantly administered oral medications. In clinical pharmacology trials, liraglutide did not affect the absorption of the tested orally administered medications to any clinically relevant degree [see Clinical Pharmacology (12.3)]. Nonetheless, caution should be exercised when oral medications are concomitantly administered with liraglutide containing products. Based on animal reproduction studies, there may be risks to the fetus from exposure to liraglutide during pregnancy. XULTOPHY 100/3.6 should be used during pregnancy only if the potential benefit justifies the potential risk to the fetus. There are no available data with XULTOPHY 100/3.6, insulin degludec or liraglutide in pregnant women to inform a drug associated risk for major birth defects and miscarriage. There are clinical considerations regarding the risks of poorly controlled diabetes in pregnancy [see Clinical Considerations]. For insulin degludec, rats and rabbits were exposed in animal reproduction studies at 5 times (rat) and 10 times (rabbit) the human exposure at a dose of 0.75 U/kg/day. No adverse outcomes were observed for pregnant animals and offspring [see Data]. For liraglutide, animal reproduction studies identified increased adverse developmental outcomes from exposure during pregnancy. Liraglutide exposure was associated with early embryonic deaths and an imbalance in some fetal abnormalities in pregnant rats administered liraglutide during organogenesis at doses that approximate clinical exposures at the maximum recommended human dose (MRHD) of 1.8 mg/day. In pregnant rabbits administered liraglutide during organogenesis, decreased fetal weight and an increased incidence of major fetal abnormalities were seen at exposures below the human exposures at the MRHD [see Data]. Poorly controlled diabetes in pregnancy increases the maternal risk for diabetic ketoacidosis, pre-eclampsia, spontaneous abortions, preterm delivery, and delivery complications. Poorly controlled diabetes mellitus increases the fetal risk for major birth defects, stillbirth, macrosomia related morbidity. Insulin degludec was investigated in studies covering fertility, embryo-fetal development and pre- and post-natal development in rats and during the period of embryo-fetal development in rabbits. Human insulin (NPH insulin) was included as comparator. In these studies insulin degludec was given subcutaneously at up to 21 U/kg/day in rats and 3.3 U/kg/day in rabbits, resulting in 5 times (rat) and 10 times (rabbit) the human exposure (AUC) at a human subcutaneous dose of 0.75 U/kg/day. Overall the effects of insulin degludec were similar to those observed with human insulin. Pregnant rabbits given subcutaneous doses of 0.01, 0.025 and 0.05 mg/kg/day liraglutide from gestation day 6 through day 18 inclusive, had estimated systemic exposures less than the human exposure at the MRHD of 1.8 mg/day at all doses, based on plasma AUC. Liraglutide decreased fetal weight and dose dependently increased the incidence of total major fetal abnormalities at all doses. The incidence of malformations exceeded concurrent and historical controls at 0.01 mg/kg/day (kidneys, scapula), ≥ 0.01 mg/kg/day (eyes, forelimb), 0.025 mg/kg/day (brain, tail and sacral vertebrae, major blood vessels and heart, umbilicus), ≥ 0.025 mg/kg/day (sternum) and at 0.05 mg/kg/day (parietal bones, major blood vessels). Irregular ossification and/or skeletal abnormalities occurred in the skull and jaw, vertebrae and ribs, sternum, pelvis, tail, and scapula; and dose-dependent minor skeletal variations were observed. Visceral abnormalities occurred in blood vessels, lung, liver, and esophagus. Bilobed or bifurcated gallbladder was seen in all treatment groups, but not in the control group. In pregnant female rats given subcutaneous doses of 0.1, 0.25 and 1.0 mg/kg/day liraglutide from gestation day 6 through weaning or termination of nursing on lactation day 24, estimated systemic exposures were 0.8-, 3-, and 11-times human exposure at the MRHD of 1.8 mg/day, based on plasma AUC. A slight delay in parturition was observed in the majority of treated rats. Group mean body weight of neonatal rats from liraglutide-treated dams was lower than neonatal rats from control group dams. Bloody scabs and agitated behavior occurred in male rats descended from dams treated with 1 mg/kg/day liraglutide. Group mean body weight from birth to postpartum day 14 trended lower in F2 generation rats descended from liraglutide-treated rats compared to F2 generation rats descended from controls, but differences did not reach statistical significance for any group. There are no data on the presence of liraglutide or insulin degludec in human milk, the effects on the breastfed infant, or the effects on milk production. In lactating rats, insulin degludec and liraglutide, the two components of XULTOPHY 100/3.6, were present in milk. The developmental and health benefits of breastfeeding should be considered along with the mother’s clinical need for XULTOPHY 100/3.6 and any potential adverse effects on the breastfed infant from XULTOPHY 100/3.6 or from the underlying maternal condition. In lactating rats, insulin degludec was present in milk at a concentration lower than that in plasma. Safety and effectiveness of XULTOPHY 100/3.6 have not been established in pediatric patients. Of the total number of 1881 subjects in clinical studies of XULTOPHY 100/3.6, 375 (19.9%) were 65 years and over, while 52 (2.8%) were 75 years and over. No overall differences in safety or effectiveness were observed between these subjects and younger subjects, and other reported clinical experience has not identified differences in responses between the elderly and younger patients, but greater sensitivity of some older individuals to the effects of XULTOPHY 100/3.6 cannot be ruled out. Age had no clinically relevant effect on the pharmacokinetics of XULTOPHY 100/3.6 [see Clinical Pharmacology (12.3)]. In elderly patients with diabetes, the initial dosing, dose increments, and maintenance dosage should be conservative to avoid hypoglycemic reactions. Hypoglycemia may be more difficult to recognize in the elderly. There is limited experience with XULTOPHY 100/3.6 in patients with mild and moderate renal impairment and when used in these patients, additional glucose monitoring and XULTOPHY 100/3.6 dose adjustments may be required on an individual basis. XULTOPHY 100/3.6 has not been studied in patients with severe renal impairment [see Warnings and Precautions (5.7) and Clinical Pharmacology (12.3)]. No clinically relevant difference in the pharmacokinetics of insulin degludec was identified in a study comparing healthy subjects and subjects with renal impairment including subjects with end stage renal disease. The safety and efficacy of liraglutide was evaluated in a 26 week clinical study that included patients with moderate renal impairment (eGFR 30 to 60 mL/min/1.73 m2). In the liraglutide treatment arm of a cardiovascular outcomes trial (LEADER trial) [see Clinical Studies (14.4)], 1932 (41.4%) patients had mild renal impairment, 999 (21.4%) patients had moderate renal impairment and 117 (2.5%) patients had severe renal impairment at baseline. No overall differences in safety or efficacy were seen in these patients compared to patients with normal renal function. There is limited experience with liraglutide in patients with end stage renal disease. There have been postmarketing reports of acute renal failure and worsening of chronic renal failure, which may sometimes require hemodialysis [see Warnings and Precautions (5.7) and Adverse Reactions (6.3)]. XULTOPHY 100/3.6 has not been studied in patients with hepatic impairment. No clinically relevant difference in the pharmacokinetics of insulin degludec, one of the components of XULTOPHY 100/3.6, was identified in a study comparing healthy subjects and subjects with hepatic impairment (mild, moderate, and severe hepatic impairment) [see Clinical Pharmacology (12.3)]. There is limited experience in patients with mild, moderate or severe hepatic impairment with liraglutide, one of the components of XULTOPHY 100/3.6 [see Clinical Pharmacology (12.3)]. Liraglutide, one of the components of XULTOPHY 100/3.6, slows gastric emptying. XULTOPHY 100/3.6 has not been studied in patients with pre-existing gastroparesis. Hypoglycemia (from insulin and liraglutide) and gastrointestinal adverse reactions (from liraglutide) may develop if a patient is dosed with more XULTOPHY 100/3.6than required. An excess of insulin-containing products like XULTOPHY 100/3.6 relative to food intake, energy expenditure, or both may lead to severe and sometimes prolonged and life-threatening hypoglycemia and hypokalemia [see Warnings and Precautions (5.6, 5.10)]. Mild episodes of hypoglycemia usually can be treated with oral glucose. Adjustments in drug dosage, meal patterns, or exercise may be needed. More severe episodes of hypoglycemia with coma, seizure, or neurologic impairment may be treated with intramuscular/subcutaneous glucagon or concentrated intravenous glucose. After apparent clinical recovery from hypoglycemia, continued observation and additional carbohydrate intake may be necessary to avoid reoccurrence of hypoglycemia. Hypokalemia must be corrected appropriately. Overdoses have been reported in clinical trials and postmarketing use of liraglutide, one of the components of XULTOPHY 100/3.6. Effects have included severe nausea and severe vomiting. In the event of overdosage, appropriate supportive treatment should be initiated according to the patient’s clinical signs and symptoms. XULTOPHY 100/3.6 (insulin degludec and liraglutide injection), for subcutaneous use, is a combination of a long-acting basal human insulin analog, insulin degludec, and a GLP-1 receptor agonist, liraglutide. Insulin degludec is a long-acting basal human insulin analog. Insulin degludec is produced by a process that includes expression of recombinant DNA in Saccharomyces cerevisiae followed by chemical modification. XULTOPHY 100/3.6 is a sterile, aqueous, clear, and colorless solution. Each pre-filled pen contains 3 mL equivalent to 300 units insulin degludec and 10.8 mg liraglutide. Each mL contains 100 units insulin degludec and 3.6 mg liraglutide. XULTOPHY 100/3.6 contains the following inactive ingredients per mL: glycerol 19.7 mg, phenol 5.70 mg, zinc 55 mcg, and water for injection. XULTOPHY 100/3.6 has a pH of approximately 8.15. Hydrochloric acid or sodium hydroxide may be added to adjust pH. XULTOPHY 100/3.6 is a combination product consisting of insulin degludec and liraglutide. The primary activity of insulin degludec is the regulation of glucose metabolism. Insulin and its analogs lower blood glucose by stimulating peripheral glucose uptake, especially by skeletal muscle and fat, and by inhibiting hepatic glucose production. Insulin also inhibits lipolysis and proteolysis, and enhances protein synthesis. Liraglutide is a Glucagon-Like Peptide-1 (GLP-1) receptor agonist that increases glucose-dependent insulin release, decreases glucagon secretion, and slows gastric emptying. Following a single dose administration, XULTOPHY 100/3.6 has a duration of action reflecting the combination of the individual glucodynamic action profiles of insulin degludec and liraglutide. Following once-daily administration, XULTOPHY 100/3.6 lowers fasting plasma glucose levels and postprandial glucose levels. The effect of XULTOPHY 100/3.6 on QTc has not been studied. The effect of liraglutide, one of the components of XULTOPHY 100/3.6, on cardiac repolarization was tested in a QTc study. Liraglutide, at steady state concentrations with daily doses up to 1.8 mg, did not produce QTc prolongation. Overall, the pharmacokinetics of insulin degludec and liraglutide were not affected in a clinically relevant manner when administered as XULTOPHY 100/3.6. In patients with type 2 diabetes (mean body weight 87.5 kg) reaching the maximum daily dose (50 units/1.8 mg) of XULTOPHY 100/3.6, the estimated mean steady-state exposure (AUC 0-24 h) of insulin degludec was 113 h*nmol/L and of liraglutide 1227 h*ng/mL based on population pharmacokinetic analysis. The corresponding maximum concentrations were 5196 pmol/L for insulin degludec and 55 ng/mL for liraglutide. 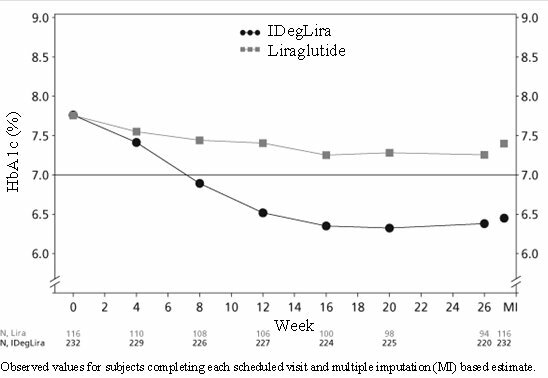 Steady state concentrations of insulin degludec and liraglutide are reached after 2-3 days of daily administration. Insulin degludec and liraglutide are extensively bound to plasma proteins >99% and >98%, respectively. Degradation of insulin degludec is similar to that of human insulin; all metabolites formed are inactive. The half-life of insulin degludec is approximately 25 hours and the half-life of liraglutide is approximately 13 hours. Age had no clinically relevant effect on the pharmacokinetics of XULTOPHY 100/3.6 based on results from a population pharmacokinetic analysis including adult patients up to 83 years treated with XULTOPHY 100/3.6 [see Use in Specific Populations (8.5)]. Gender, race or ethnic origin had no clinically relevant effect on the pharmacokinetics of XULTOPHY 100/3.6 based on results from a population pharmacokinetic analysis. The effect of body weight on the exposure level of the components of XULTOPHY 100/3.6 was investigated in the population pharmacokinetic analysis. Exposure levels decreased with increase in baseline body weight for both insulin degludec and liraglutide. There is limited experience with XULTOPHY 100/3.6 in patients with mild and moderate renal impairment. XULTOPHY 100/3.6 has not been studied in patients with severe renal impairment [see Warnings and Precautions (5.7)]. Insulin degludec has been studied in a pharmacokinetic study in 32 subjects (n=6/group) with normal or impaired renal function/end-stage renal disease following administration of a single dose (0.4U/kg) of insulin degludec. Renal function was defined using creatinine clearance (Clcr) as follows: >80 mL/min (normal), 50-80 mL/min (mild), 30-50 mL/min (moderate) and <30 mL/min (severe). Subjects requiring dialysis were classified as having end-stage renal disease (ESRD). Total exposure (AUCIDeg,0-120h,SD) of insulin degludec was similar in subjects with normal and impaired renal function. No clinically relevant difference in the pharmacokinetics of insulin degludec was identified between healthy subjects and subjects with renal impairment. Hemodialysis did not affect clearance of insulin degludec (CL/FIDeg,SD) in subjects with ESRD [see Warnings and Precautions (5.7)]. The single-dose pharmacokinetics of liraglutide were evaluated in subjects with varying degrees of renal impairment. Subjects with mild (estimated creatinine clearance 50-80 mL/min) to severe (estimated creatinine clearance <30 mL/min) renal impairment and subjects with end-stage renal disease requiring dialysis were included in the trial. Compared to healthy subjects, liraglutide AUC in mild, moderate, and severe renal impairment and in end-stage renal disease was on average 35%, 19%, 29% and 30% lower, respectively [see Warnings and Precautions (5.7)]. Insulin degludec has been studied in a pharmacokinetic study in 24 subjects (n=6/group) with normal or impaired hepatic function (mild, moderate, and severe hepatic impairment) following administration of a single dose (0.4U/kg) of insulin degludec. Hepatic function was defined using Child-Pugh Scores ranging from 5 (mild hepatic impairment) to 15 (severe hepatic impairment). No clinically relevant differences in the pharmacokinetics of insulin degludec were identified between healthy subjects and subjects with hepatic impairment [see Hepatic Impairment (8.7)]. The single-dose pharmacokinetics of liraglutide were evaluated in subjects with varying degrees of hepatic impairment. Subjects with mild (Child Pugh score 5-6) to severe (Child Pugh score > 9) hepatic impairment were included in the trial. Compared to healthy subjects, liraglutide AUC in subjects with mild, moderate and severe hepatic impairment was on average 11%, 14% and 42% lower, respectively. In vitro data suggest that the potential for pharmacokinetic drug interactions related to CYP interaction and protein binding is low for both the liraglutide and insulin degludec components of XULTOPHY 100/3.6. The delay of gastric emptying with liraglutide one of the components of XULTOPHY 100/3.6 may influence absorption of concomitantly administered oral medicinal products. Interaction studies did not show any clinically relevant delay of absorption. The drug-drug interaction studies were performed at steady state with liraglutide 1.8 mg/day. Before administration of concomitant treatment, subjects underwent a 0.6 mg weekly dose increase to reach the maximum dose of 1.8 mg/day. Administration of the interacting drugs was timed so that Cmax of liraglutide (8-12 h) would coincide with the absorption peak of the co-administered drugs. Liraglutide did not change the overall exposure (AUC) of atorvastatin following a single dose of atorvastatin 40 mg, administered 5 hours after the dose of liraglutide at steady state. Atorvastatin Cmax was decreased by 38% and median Tmax was delayed from 1 to 3 hours with liraglutide. A single dose of an oral contraceptive combination product containing 0.03 mg ethinylestradiol and 0.15 mg levonorgestrel was administered under fed conditions and 7 hours after the dose of liraglutide at steady state. Liraglutide lowered ethinylestradiol and levonorgestrel Cmax by 12% and 13%, respectively. There was no effect of liraglutide on the overall exposure (AUC) of ethinylestradiol. Liraglutide increased the levonorgestrel AUC0-∞ by 18%. Liraglutide delayed Tmax for both ethinylestradiol and levonorgestrel by 1.5 hours. No studies have been conducted with the XULTOPHY 100/3.6 combination to evaluate carcinogenesis, mutagenesis or impairment of fertility. The following data are based upon studies with insulin degludec and liraglutide individually. Standard 2-year carcinogenicity studies in animals have not been performed to evaluate the carcinogenic potential of insulin degludec. In a 52-week study including human insulin (NPH insulin) as comparator, Sprague-Dawley rats were dosed subcutaneously with insulin degludec at 3.3, 6.7, and 10 U/kg/day, resulting in 5 times the human exposure (AUC) when compared to a human subcutaneous dose of 0.75 U/kg/day. Human insulin was dosed at 6.7 U/kg/day. No treatment-related increases in incidences of hyperplasia, benign or malignant tumors were recorded in female mammary glands from rats dosed with insulin degludec and no treatment related changes in the female mammary gland cell proliferation were found using BrdU incorporation. Further, no treatment related changes in the occurrence of hyperplastic or neoplastic lesions were seen in any animals dosed with insulin degludec when compared to vehicle or human insulin. Genotoxicity testing of insulin degludec was not performed. In a combined fertility and embryo-fetal study in male and female rats, treatment with insulin degludec up to 21 U/kg/day (approximately 5 times the human subcutaneous dose of 0.75 U/kg/day, based on U/body surface area) prior to mating and in female rats during gestation had no effect on mating performance and fertility. A 104-week carcinogenicity study was conducted in male and female CD-1 mice at doses of 0.03, 0.2, 1.0, and 3.0 mg/kg/day liraglutide administered by bolus subcutaneous injection yielding systemic exposures 0.2-, 2-, 10- and 45-times the human exposure, respectively, at the MRHD of 1.8 mg/day based on plasma AUC comparison. A dose-related increase in benign thyroid C-cell adenomas was seen in the 1.0 and the 3.0 mg/kg/day groups with incidences of 13% and 19% in males and 6% and 20% in females, respectively. C-cell adenomas did not occur in control groups or 0.03 and 0.2 mg/kg/day groups. Treatment-related malignant C-cell carcinomas occurred in 3% of females in the 3.0 mg/kg/day group. Thyroid C-cell tumors are rare findings during carcinogenicity testing in mice. A treatment-related increase in fibrosarcomas was seen on the dorsal skin and subcutis, the body surface used for drug injection, in males in the 3 mg/kg/day group. These fibrosarcomas were attributed to the high local concentration of drug near the injection site. The liraglutide concentration in the clinical formulation (6 mg/mL) is 10-times higher than the concentration in the formulation used to administer 3 mg/kg/day liraglutide to mice in the carcinogenicity study (0.6 mg/mL). A 104-week carcinogenicity study was conducted in male and female Sprague Dawley rats at doses of 0.075, 0.25 and 0.75 mg/kg/day liraglutide administered by bolus subcutaneous injection with exposures 0.5-, 2- and 8-times the human exposure, respectively, resulting from the MRHD based on plasma AUC comparison. A treatment-related increase in benign thyroid C-cell adenomas was seen in males in 0.25 and 0.75 mg/kg/day liraglutide groups with incidences of 12%, 16%, 42%, and 46% and in all female liraglutide-treated groups with incidences of 10%, 27%, 33%, and 56% in 0 (control), 0.075, 0.25, and 0.75 mg/kg/day groups, respectively. A treatment-related increase in malignant thyroid C-cell carcinomas was observed in all male liraglutide-treated groups with incidences of 2%, 8%, 6%, and 14% and in females at 0.25 and 0.75 mg/kg/day with incidences of 0%, 0%, 4%, and 6% in 0 (control), 0.075, 0.25, and 0.75 mg/kg/day groups, respectively. Thyroid C-cell carcinomas are rare findings during carcinogenicity testing in rats. In rat fertility studies using subcutaneous doses of 0.1, 0.25 and 1.0 mg/kg/day liraglutide, males were treated for 4 weeks prior to and throughout mating and females were treated 2 weeks prior to and throughout mating until gestation day 17. No direct adverse effects on male fertility was observed at doses up to 1.0 mg/kg/day, a high dose yielding an estimated systemic exposure 11- times the human exposure at the MRHD, based on plasma AUC. In female rats, an increase in early embryonic deaths occurred at 1.0 mg/kg/day. Reduced body weight gain and food consumption were observed in females at the 1.0 mg/kg/day dose. A total of 3488 patients with type 2 diabetes participated in 5 randomized, parallel and active or placebo-controlled phase 3 trials of 26 weeks duration. Two studies were conducted in patients inadequately controlled on one or more OADs (e.g. metformin, pioglitazone, sulfonylurea,) (Tables 5-6). Three studies were conducted in patients converting from liraglutide or basal insulin: one study was conducted in patients converting from liraglutide (with doses up to 1.8 mg), (Table 7), one study was conducted in patients converting from any basal insulin (Table 8), and one study was conducted in patients converting from insulin glargine U-100 (Table 9). In all trials, XULTOPHY 100/3.6 was titrated twice weekly by increments or decrements of 2 units (2 units insulin degludec/0.072 mg liraglutide), towards a pre-specified fasting plasma glucose target. The same titration algorithm was applied for basal insulin comparators. NCT01336023: The efficacy and safety of XULTOPHY 100/3.6 compared to insulin degludec and liraglutide, all administered once-daily, was studied in a 26-week randomized, open-label, three-arm parallel trial in 1660 patients with type 2 diabetes mellitus inadequately controlled on 1-2 OADs (metformin or metformin with or without pioglitazone). The mean age of the trial population was 55 years and mean duration of diabetes was 6.8 years. 50.8% were male. 61.9% were White, 7.4% were Black or African American and 15.1% were Hispanic, 5.4% of patients had eGFR < 60mL/min/1.73m2; no patients had eGFR < 30mL/min/1.73m2. The mean BMI was 31.2 kg/m2. The starting dose of XULTOPHY 100/3.6 was 10 units (10 units insulin degludec/0.36 mg liraglutide). The starting dose of insulin degludec was 10 units. Patients in the liraglutide arm followed a fixed dose escalation scheme with a starting dose of 0.6 mg and a dose increase of 0.6 mg weekly until the maintenance dose of 1.8 mg was reached. The patients continued on pre-trial treatment with metformin or metformin and pioglitazone throughout the entire trial. XULTOPHY 100/3.6 and insulin degludec were titrated twice weekly towards a target fasting plasma glucose target of 72-90 mg/dL. At the end of 26 weeks, treatment with XULTOPHY 100/3.6, insulin degludec, and liraglutide resulted in a reduction in HbA1c from baseline of 1.81%, 1.35% and 1.21%, respectively, (see Table 5) . The end of trial dose of XULTOPHY 100/3.6 was 38 units (38 units insulin degludec/1.37 mg liraglutide). A p<0.01. Primary endpoint was tested for non-inferiority of XULTOPHY 100/3.6 to insulin degludec based on pre-specified non-inferiority margin of 0.3% and for superiority of XULTOPHY 100/3.6 to liraglutide. # Estimated using an ANCOVA with treatment, baseline HbA 1c stratum, sub-study, concomitant diabetes treatment and country as factors and baseline response as covariate. Multiple imputation modelled “return to baseline” of the treatment effect for subjects having missing week 26 data. ## Patients with missing HbA 1c value at week 26 data were considered non-responders. When applying the multiple imputation method described in (#) above, the estimated percent achieving HbA 1c<7% were 78.9%, 64.7% and 58.8% for XULTOPHY 100/3.6, Insulin degludec and liraglutide respectively when adjusting for baseline HbA 1c stratum, sub-study, concomitant diabetes treatment, country and baseline HbA 1c. There were 11.8% of subjects in the XULTOPHY 100/3.6 arm, 12.3% in the insulin degludec arm and 15.5% in the liraglutide arm for whom HbA 1c data was missing at week 26. NCT01618162: The efficacy and safety of once-daily therapy with XULTOPHY 100/3.6 compared to placebo were studied in a 26-week randomized, double-blind, treat-to-target trial in 435 patients with type 2 diabetes mellitus inadequately controlled on sulfonylurea alone or in combination with metformin. The mean age of the trial population was 59.8 years and mean duration of diabetes was 9.12 years. 52.2% were male. 75.4% were White, 6.7% were Black or African American and 9.2% were Hispanic. 10.6% of patients had eGFR < 60mL/min/1.73m2; no patients had eGFR < 30mL/min/1.73m2. The mean BMI was 31.5 kg/m2. The starting dose of XULTOPHY 100/3.6 was 10 units (10 units insulin degludec/0.36 mg liraglutide). The patients continued on pre-trial treatment with sulfonylurea, with or without metformin throughout the entire trial. XULTOPHY 100/3.6 was titrated twice weekly towards a fasting plasma glucose target of 72-108 mg/dL. Treatment with XULTOPHY 100/3.6 for 26 weeks resulted in statistically significant reductions in HbA1c compared to placebo (see Table 6). The end of trial dose of XULTOPHY 100/3.6 was 28 units (28 units insulin degludec/1.01 mg liraglutide). Ap<0.01. Primary endpoint was tested for superiority of XULTOPHY 100/3.6 to placebo. 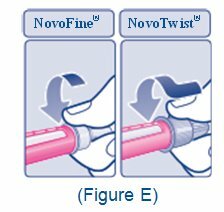 # Estimated using an ANCOVA with treatment, region and pre-trial medication as fixed factors and baseline response as covariate. Multiple imputation modelled “jump-to-control” of the treatment effect for subjects having missing week 26 data. ## Patients with missing HbA1c value at week 26 data were considered non-responders. When applying the multiple imputation method described in (#) above, the estimated percent achieving HbA1c<7% were 77.8% and 34.4% for XULTOPHY 100/3.6 and placebo respectively when adjusting for region, pre-trial medication and baseline HbA1c. There were 12.8% of subjects in the XULTOPHY 100/3.6 arm and 24.7% in the placebo arm for whom HbA1c data was missing at week 26. ### Dose of sulfonylurea was ≥ half of the maximum approved dose. NCT01676116: The efficacy and safety of XULTOPHY 100/3.6 (once-daily) compared to unchanged pre-trial liraglutide up to a dose of 1.8 mg daily, were studied in a 26-week randomized, open-label, treat-to-target (FPG goal of 72-90 mg/dL) trial. The trial included 348 patients with type 2 diabetes mellitus inadequately controlled on liraglutide and metformin alone or in combination with pioglitazone, sulfonylurea or both. Oral anti-diabetic drugs (OADs) were continued at pre-trial doses and dosing frequency throughout the trial and 21.8% of all subjects were treated with sulfonylureas (SU) in combination with metformin with or without pioglitazone. The mean age of the population was 58.1 years and mean duration of diabetes was 10.0 years. 49.1% were male. 90.8% were White, 7.5% Black or African American. 10.6% were Hispanic. 5.7% of patients had eGFR < 60mL/min/1.73m2; no patient had eGFR < 30mL/min/1.73m2. The mean BMI was approximately 33.1 kg/m2. The starting dose of XULTOPHY 100/3.6 was 16 units (16 units insulin degludec/0.58 mg liraglutide) and the average starting dose of liraglutide was 1.7 mg. XULTOPHY 100/3.6 was titrated twice weekly to target a fasting plasma glucose goal of <90 mg/dL. The end of trial dose of XULTOPHY was 44 units (44 units insulin degludec/1.58 mg liraglutide). The primary endpoint, change in HbA1c, was tested for superiority of XULTOPHY 100/3.6 to unchanged liraglutide therapy. At the end of 26 weeks, there was a reduction in HbA1c from baseline of 1.31% for XULTOPHY 100/3.6 and 0.36% for liraglutide (see Table 7). # Estimated using an ANCOVA with treatment, pre-trial liraglutide and region as fixed factors and baseline response as covariate. Multiple imputation modelled “return to baseline” of the treatment effect for subjects having missing week 26 data. ## Patients with missing HbA 1c data at week 26 were considered as non-responders. When applying the multiple imputation method described in ( #) above, the estimated percent achieving HbA 1c<7% were 77.9% and 31.0% for XULTOPHY 100/3.6 and liraglutide, respectively, when adjusting for pre-trial liraglutide or region and baseline HbA 1c. There were 5.2% of subjects in the XULTOPHY 100/3.6 arm and 19.0% in the liraglutide arm for whom HbA 1c data was missing at week 26. NCT01392573: The efficacy and safety of XULTOPHY 100/3.6 compared to insulin degludec, both once daily and added on to metformin, were studied in a 26-week randomized, double-blind, trial in 398 patients with type 2 diabetes mellitus inadequately controlled on basal insulin and metformin alone or in combination with sulfonylurea/glinides. Basal insulin and sulfonylurea/glinides were discontinued at randomization. The mean age of the trial population was 57.2 years and mean duration of diabetes was 10.6 years. 54.8% were male. 77.4% were White, 4.8% Black or African American. 10.1% were Hispanic. 6.8% of patients had eGFR < 60mL/min/1.73m2; no patient had eGFR < 30mL/min/1.73m2. The mean BMI was approximately 33.7 kg/m2. The mean dose of metformin and basal insulin in patients entering the trial was 1984 mg and 29 units respectively. XULTOPHY 100/3.6 and degludec were to be titrated twice weekly to target a fasting plasma glucose goal of <90 mg/dL. The starting dose of XULTOPHY 100/3.6 and insulin degludec was 16 units (16 units insulin degludec/0.58 mg liraglutide) and 16 units, respectively. Patients could not increase their dose by more than 4 units per week and the prespecified maximum dose of insulin degludec was limited to 50 units. The targeted fasting plasma glucose goal was achieved in 24.0% of patients randomized to insulin degludec and 31.6% of the patients randomized to XULTOPHY 100/3.6 at 26 weeks. At the end of 26 weeks, the reduction in HbA1c from baseline of 1.94% for XULTOPHY 100/3.6 and 1.05% for insulin degludec limited to 50 units daily were observed (see Table 8). The mean difference (95% CI) in HbA1c reduction between XULTOPHY 100/3.6 and insulin degludec was -0.89 [-1.10; -0.68] and statistically significant. The trial was designed to show the contribution of the liraglutide component to glycemic lowering and the insulin degludec dosing algorithm was selected to isolate the effect of the GLP-1 component. At the end of the trial, the doses of insulin degludec were equivalent between treatment groups. The mean final dose of XULTOPHY 100/3.6 and insulin degludec was 46 units (for XULTOPHY 100/3.6: 46 units insulin degludec/1.66 mg liraglutide). The difference in glucose lowering effect observed in the trial may not necessarily reflect the effect that will be observed in the care setting where insulin degludec dosage can be different than that used in the trial. Ap<0.01. The trial was designed to show the contribution of the liraglutide component to glycemic lowering and the insulin degludec dosing algorithm was selected to isolate the effect of the GLP-1 component. At the end of the trial, the doses of insulin degludec were equivalent between treatment groups. The mean final dose of XULTOPHY 100/3.6 and insulin degludec was 46 units (for XULTOPHY 100/3.6: 46 units insulin degludec/1.66 mg liraglutide). The difference in glucose lowering effect observed in the trial may not necessarily reflect the effect that will be observed in the care setting where alternative insulin degludec dosage can be used. # Estimated using an ANCOVA with treatment, country, and previous antidiabetic treatment as fixed factors and baseline response as covariate. Multiple imputation modelled “jump to control” of the treatment effect for subjects having missing week 26 data. ## Patients with missing HbA 1c data at week 26 were considered non-responders. When applying the multiple imputation method described in ( #) above, the estimated percents achieving HbA 1c<7% were 60.4% and 24.9% for XULTOPHY 100/3.6 and insulin degludec respectively when adjusting for previous antidiabetic treatment, region and baseline HbA 1c. NCT01952145: The efficacy and safety of XULTOPHY 100/3.6 compared to insulin glargine U-100, both once daily and added on to metformin, were studied in a 26-week randomized, open-label, two-arm parallel trial in 557 patients with type 2 diabetes mellitus inadequately controlled on insulin glargine U-100 and metformin. The mean age of the trial population was 58.8 years and mean duration of diabetes was 11.5 years. 50.3% were male. 94.6% were White, 2% Black or African American. 43.1% were Hispanic. 6.3% of patients had eGFR < 60mL/min/1.73m2; one patient had eGFR < 30mL/min/1.73m2. The mean BMI was approximately 31.7 kg/m2. The mean dose of insulin glargine U-100 in patients entering the trial was 32 units. XULTOPHY 100/3.6 and insulin glargine were to be titrated twice weekly to target a fasting plasma glucose goal of <90 mg/dL. The starting dose of XULTOPHY 100/3.6 was 16 units (16 units insulin degludec/0.58 mg liraglutide). The average starting dose of insulin glargine U-100 was 32 units. Patients could not increase the dose of the two products by more than 4 units per week and there was no maximum allowed dose of insulin glargine. The targeted fasting plasma glucose goal was achieved in 39.6% of patients randomized to insulin glargine and 32.9% of the patients randomized to XULTOPHY 100/3.6 at 26 weeks. At the end of 26 weeks, treatment with XULTOPHY 100/3.6 resulted in a reduction in HbA1c from baseline of 1.67% and 1.16% for insulin glargine U-100 (see Table 9) and excluded the pre-specified non-inferiority margin of 0.3%. At the end of the trial, the average dose of XULTOPHY 100/3.6 was 41 units (41 units insulin degludec/1.48 mg liraglutide) and the dose of glargine was 66 units, it is unclear that these observed differences in insulin doses are clinically important. The difference in HbA1c effect observed in the trial may not necessarily reflect the effect that will be observed in the care setting where alternative insulin glargine dosage can be used. Ap<0.01. Primary endpoint was tested for noninferiority of XULTOPHY 100/3.6 to insulin glargine U-100. The difference in glucose lowering effect observed in the trial may not necessarily reflect the effect that will be observed in the care setting where alternative insulin glargine dosage can be used. # Estimated using an ANCOVA with treatment and region as fixed factors and baseline response as covariate. Multiple imputation modelled “return to baseline” of the treatment effect for subjects having missing week 26 data. ## Patients with missing HbA 1c value at week 26 data were considered non-responder. When applying the multiple imputation method described in ( #) above, the estimated percents achieving HbA 1c<7% were 71.9% and 45.1% for XULTOPHY 100/3.6 and insulin glargine U-100 respectively when adjusting for region and baseline HbA 1c. There were 10.1% of subjects in the XULTOPHY 100/3.6 arm and 4.7% in the insulin glargine U-100 arm for whom HbA 1c data was missing at week 26. The effect of XULTOPHY 100/3.6 on the risk of cardiovascular outcomes in patients with type 2 diabetes mellitus and atherosclerotic cardiovascular disease has not been established. The studies below were conducted with liraglutide 1.8 mg and insulin degludec, individually. The LEADER trial (NCT01179048) randomized 9340 patients with inadequately controlled type 2 diabetes and cardiovascular disease to liraglutide 1.8 mg or placebo in addition to standard of care treatments for type 2 diabetes for a median follow up of 3.5 years. Patients either were 50 years of age or older with established, stable cardiovascular, cerebrovascular, peripheral artery disease, chronic kidney disease or chronic heart failure (80% of patients) or were 60 years of age or older and had other specified risk factors for cardiovascular disease (20% of patients). The population was 64% male, 78% Caucasian, 10% Asian, and 8% Black; 12% of the population was Hispanic or Latino. The mean duration of type 2 diabetes was 13 years, the mean HbA1c was 8.7% and the mean BMI was 33 kg/m2; the mean eGFR at baseline was 79 mL/min/1.73 m2. In total, 96.8% of the patients completed the trial; vital status was available for 99.7%. The primary endpoint was the time from randomization to first occurrence of a major adverse cardiovascular event (MACE) defined as: cardiovascular death, non-fatal myocardial infarction, or non-fatal stroke. No increased risk for MACE was observed with liraglutide 1.8 mg. The total number of primary component MACE endpoints was 1302 (608[13.0%] with liraglutide 1.8 mg and 694 [14.9%] with placebo). The DEVOTE trial (NCT01959529) randomized 7,637 patients with inadequately controlled type 2 diabetes and cardiovascular disease to either insulin degludec or insulin glargine U-100. Each was administered once-daily in addition to standard of care treatments for diabetes for a median duration of follow up of 2 years. Patients either were 50 years of age or older and had established, stable cardiovascular, cerebrovascular, peripheral artery disease, chronic kidney disease or chronic heart failure (85% of patients) or were 60 years of age or older and had other specified risk factors for cardiovascular disease (15% of patients). The population was 63% male, 76% White 11% Black or African American, and 10% Asian; 15% of the population was Hispanic or Latino. The mean HbA1c was 8.4% and the mean BMI was 33.6 kg/m2. The baseline mean estimated glomular filtration rate (eGFR) was 68 mL/min/1.73m2. In total, 98% of the patients completed the trial; vital status was known at the end of the trial for 99%. The primary endpoint was the time from randomization to the first occurrence of a major adverse cardiovascular event (MACE), defined as: cardiovascular death, non-fatal myocardial infarction, or non-fatal stroke. No increased risk for MACE was observed with insulin degludec when compared to insulin glargine U-100. The total number of primary MACE endpoints was 681 (325 [8.5%] with insulin degludec and 356 [9.3%] with insulin glargine). XULTOPHY 100/3.6 is an injection supplied as a sterile, clear, colorless solution in a 3 mL pre-filled, disposable, single-patient use pen injector. The XULTOPHY 100/3.6 pen dials in one unit increments. Prior to first use, XULTOPHY 100/3.6 should be stored between 2°C and 8°C (36°F to 46°F) until the expiration date printed on the label. Store prefilled pens in the carton so they will stay clean and protected from light. Do not store in the freezer or directly adjacent to the refrigerator cooling element. Do not freeze. Do not use XULTOPHY 100/3.6 if it has been frozen. After first use, the XULTOPHY 100/3.6 pen can be stored for 21 days at controlled room temperature (59°F to 86°F; 15°C to 30°C) or in a refrigerator (36°F to 46°F; 2°C to 8°C). Keep all XULTOPHY 100/3.6 pens away from direct heat and light. Always remove the needle after each injection and store the XULTOPHY 100/3.6 pen without a needle attached. This prevents contamination and/or infection, or leakage of the XULTOPHY 100/3.6 pen, and will ensure accurate dosing. Always use a new needle for each injection to prevent contamination. Inform patients that liraglutide, one of the components of XULTOPHY 100/3.6, causes benign and malignant thyroid C-cell tumors in mice and rats and that the human relevance of this finding is unknown. Patients should be counseled to report symptoms of thyroid tumors (e.g., a lump in the neck, hoarseness, dysphagia or dyspnea) to their physician [see Boxed Warning and Warnings and Precautions (5.1)]. Advise patients of the potential risk of dehydration due to gastrointestinal adverse reactions and take precautions to avoid fluid depletion. Patients should be informed of the potential risk for worsening renal function, which in some cases may require dialysis [see Warnings and Precautions (5.7)]. Inform patients of the potential risk for pancreatitis. Explain that persistent severe abdominal pain that may radiate to the back and which may or may not be accompanied by vomiting, is the hallmark symptom of acute pancreatitis. Instruct patients to discontinue XULTOPHY 100/3.6 promptly and contact their physician if persistent severe abdominal pain occurs [see Warnings and Precautions (5.2)]. Inform patients that XULTOPHY 100/3.6 contains two drugs: insulin degludec and liraglutide. Accidental mix-ups between insulin products have been reported. To avoid medication errors between XULTOPHY 100/3.6 (an insulin containing product) and other insulin products, instruct patients to always check the label before each injection. Advise patients that the administration of more than 50 units of XULTOPHY 100/3.6 daily can result in overdose of the liraglutide component. Instruct patients not to administer concurrently with other glucagon-like peptide-1 receptor agonists. Inform patients that hypoglycemia is the most common adverse reaction with insulin products. Inform patients of the symptoms of hypoglycemia. Inform patients that the ability to concentrate and react may be impaired as a result of hypoglycemia. This may present a risk in situations where these abilities are especially important, such as driving or operating other machinery. Advise patients who have frequent hypoglycemia or reduced or absent warning signs of hypoglycemia to use caution when driving or operating machinery. Advise patients that changes in XULTOPHY 100/3.6 regimen can predispose to hyper- or hypoglycemia. Advise patients that changes in XULTOPHY 100/3.6 regimen should be made under close medical supervision [see Warnings and Precautions (5.4)]. Advise patients that they must never share a XULTOPHY 100/3.6 pen with another person, even if the needle is changed, because doing so carries a risk for transmission of blood-borne pathogens. Inform patients that serious hypersensitivity reactions have been reported during postmarketing use of liraglutide, one of the components of XULTOPHY 100/3.6. If symptoms of hypersensitivity reactions occur, patients must stop taking XULTOPHY 100/3.6 and seek medical advice promptly [see Warnings and Precautions (5.8)]. Inform patients that hepatobiliary disorders including elevations of liver enzymes, hyperbilirubinemia, cholestasis, and hepatitis have been reported during postmarketing use of liraglutide. Instruct patients to contact their physician if they develop jaundice. Instruct female patients of reproductive potential to inform their healthcare provider of a known or suspected pregnancy [see Use in Specific Populations (8.1)]. 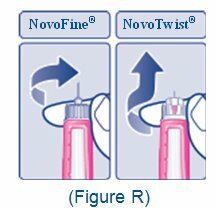 Novo Nordisk®, VICTOZA®, TRESIBA® and XULTOPHY® 100/3.6 are registered trademarks of Novo Nordisk A/S. 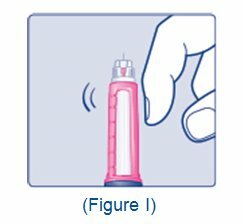 Read this Medication Guide before you start using XULTOPHY 100/3.6 and each time you get a refill. There may be new information. This information does not take the place of talking to your healthcare provider about your medical condition or your treatment. What is the most important information I should know about XULTOPHY 100/3.6? Possible thyroid tumors, including cancer. Tell your healthcare provider if you get a lump or swelling in your neck, hoarseness, trouble swallowing, or shortness of breath. These may be symptoms of thyroid cancer. In studies with rats and mice, liraglutide, one of the components of XULTOPHY 100/3.6, and medicines that work like liraglutide caused thyroid tumors, including thyroid cancer. It is not known if XULTOPHY 100/3.6 will cause thyroid tumors or a type of thyroid cancer called medullary thyroid carcinoma (MTC) in people. Do not use XULTOPHY 100/3.6 if you or any of your family have ever had a type of thyroid cancer called medullary thyroid carcinoma (MTC), or if you have an endocrine system condition called Multiple Endocrine Neoplasia syndrome type 2 (MEN 2). XULTOPHY 100/3.6 is an injectable prescription medicine that contains 2 diabetes medicines, insulin degludec, 100 units/mL, and liraglutide, 3.6 mg/mL. XULTOPHY 100/3.6 should be used along with diet and exercise to lower blood sugar (glucose) in adults with type 2 diabetes mellitus. XULTOPHY 100/3.6 is not recommended as the first choice of medicine for treating diabetes. XULTOPHY 100/3.6 is not recommended for use in combination with any other product containing liraglutide or another glucagon-like peptide 1 receptor agonist (GLP-1 receptor agonist). XULTOPHY 100/3.6 is not for use in people with type 1diabetes or people with diabetic ketoacidosis (increased ketones in the blood or urine). It is not known if XULTOPHY 100/3.6 can be used with mealtime insulin. It is not known if XULTOPHY 100/3.6 is safe and effective for use in children. Who should not use XULTOPHY 100/3.6? you are allergic to insulin degludec, liraglutide or any of the ingredients in XULTOPHY 100/3.6. See the end of this Medication Guide for a complete list of ingredients in XULTOPHY 100/3.6. you are having an episode of low blood sugar (hypoglycemia). What should I tell my healthcare provider before using XULTOPHY 100/3.6? have heart failure or other heart problems. If you have heart failure, it may get worse while you take TZDs with XULTOPHY 100/3.6. are taking certain medicines called GLP-1 receptor agonists. have had an allergic reaction to a GLP-1 receptor agonist medicine. are pregnant or plan to become pregnant. It is not known if XULTOPHY 100/3.6 will harm your unborn baby. Tell your healthcare provider if you become pregnant or think you may be pregnant while using XULTOPHY 100/3.6. are breastfeeding or plan to breastfeed. It is not known if XULTOPHY 100/3.6 passes into your breast milk. Talk to your healthcare provider about the best way to feed your baby while using XULTOPHY 100/3.6. Tell your healthcare provider about all the medicines you take, including prescription and over-the-counter medicines, vitamins, and herbal supplements. XULTOPHY 100/3.6 may affect the way some medicines work, and some medicines may affect the way XULTOPHY 100/3.6 works. Before using XULTOPHY 100/3.6, talk to your healthcare provider about low blood sugar and how to manage it. Tell your healthcare provider if you are taking other medicines to treat diabetes. How should I use XULTOPHY 100/3.6? Read the Instructions for Use that comes with XULTOPHY 100/3.6. Use XULTOPHY 100/3.6 exactly as your healthcare provider tells you to. Do not change your dosing schedule without first talking to your healthcare provider. 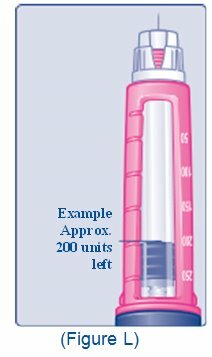 The dose counter on your XULTOPHY 100/3.6 pen shows the number of units of XULTOPHY 100/3.6 to be injected. Your healthcare provider should show you how to use XULTOPHY 100/3.6 before you use it for the first time. XULTOPHY 100/3.6 is injected under the skin (subcutaneously) of your thigh, upper arm or stomach (abdomen). Do not inject XULTOPHY 100/3.6 into a muscle (intramuscularly) or vein (intravenously) or use in an insulin infusion pump. Use XULTOPHY 100/3.6 at the same time each day with or without food. If you miss a dose of XULTOPHY 100/3.6, resume your 1 time daily dosing schedule at the next scheduled dose. Do not take 2 doses at the same time or increase your dose to make up for the missed dose. If you miss more than 3 days of XULTOPHY 100/3.6, call your healthcare provider for further instructions about taking XULTOPHY 100/3.6 at the right dose and to help lower your chance of having an upset stomach. Do not dilute XULTOPHY 100/3.6 with any other liquids. Do not mix XULTOPHY 100/3.6 with any other insulin products or GLP-1 receptor agonists in the same injection. Do not split your dose of XULTOPHY 100/3.6. Give your full dose of XULTOPHY 100/3.6 in 1 injection. 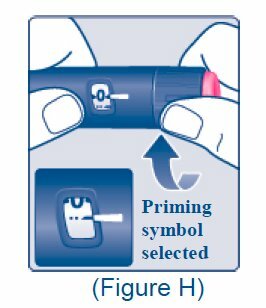 Check the Pen label each time you give your injection to make sure you are using the correct medicine. Do not take more than 50 units of XULTOPHY 100/3.6 each day. XULTOPHY 100/3.6 contains two medicines: insulin degludec and liraglutide. If you take too much XULTOPHY 100/3.6, it can cause severe nausea and vomiting. Do not take XULTOPHY 100/3.6 with other GLP-1 receptor agonists. If you take too much XULTOPHY 100/3.6, call your healthcare provider or go to the nearest hospital emergency room right away. 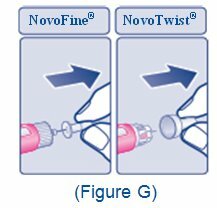 Change (rotate) your injection site with each injection to help reduce your chances of getting skin thickening or pits at the injection site. Do not use the same site for each injection. Do not share your XULTOPHY 100/3.6 pen with other people, even if the needle has been changed. You may give other people a serious infection or get a serious infection from them. What should I avoid while taking XULTOPHY 100/3.6? drive or operate heavy machinery, until you know how XULTOPHY 100/3.6 affects you. What are the possible side effects of XULTOPHY 100/3.6? inflammation of your pancreas (pancreatitis). Stop using XULTOPHY 100/3.6 and call your healthcare provider right away if you have severe pain in your stomach area (abdomen) that will not go away, with or without vomiting. You may feel the pain from your abdomen to your back. low blood sugar (hypoglycemia). Your risk for getting low blood sugar may be higher if you use XULTOPHY 100/3.6 with another medicine that can cause low blood sugar. kidney problems (kidney failure). Worsening of kidney failure and sudden kidney failure have happened in people with kidney problems and in people without kidney problems, who have taken liraglutide, one of the ingredients in XULTOPHY 100/3.6. Diarrhea, nausea, and vomiting may cause a loss of fluids (dehydration) which may cause kidney problems to get worse. Tell your healthcare provider if you have diarrhea, nausea, or vomiting. Drink plenty of fluids to help reduce your risk of dehydration during treatment with XULTOPHY 100/3.6. heart failure. Taking certain diabetes pills called thiazolidinediones or TZDs with XULTOPHY 100/3.6 may cause heart failure in some people. This can happen even if you have never had heart failure or heart problems before. If you already have heart failure, it may get worse while you take TZDs with XULTOPHY 100/3.6. Your healthcare provider should monitor you closely while you are taking TZDs with XULTOPHY 100/3.6. Tell your healthcare provider if you have any new or worse symptoms of heart failure including shortness of breath, tiredness, swelling of your ankles or feet and sudden weight gain. Treatment with TZDs and XULTOPHY 100/3.6 may need to be adjusted or stopped by your healthcare provider if you have new or worse heart failure. The most common side effects of XULTOPHY 100/3.6 include stuffy or runny nose, sore throat, headache, nausea, diarrhea, increased blood levels of lipase, and upper respiratory tract infection. Talk to your healthcare provider about any side effect that bothers you or does not go away. These are not all the possible side effects of XULTOPHY 100/3.6. Keep XULTOPHY 100/3.6 and all medicines out of the reach of children. General information about the safe and effective use of XULTOPHY 100/3.6. Medicines are sometimes prescribed for purposes other than those listed in a Medication Guide. Do not use XULTOPHY 100/3.6 for a condition for which it was not prescribed. Do not give XULTOPHY 100/3.6 to other people, even if they have the same symptoms that you have. It may harm them. You can ask your pharmacist or healthcare provider for information about XULTOPHY 100/3.6 that is written for health professionals. What are the ingredients in XULTOPHY 100/3.6? Inactive Ingredients: glycerol, phenol, zinc, and water for injection. Hydrochloric acid or sodium hydroxide may be added to adjust pH. Do not share your XULTOPHY 100/3.6 pen with another person. You may give an infection to them or get an infection from them. XULTOPHY 100/3.6 pen (“pen”) is a prefilled disposable pen containing 300 units of insulin degludec and 10.8 mg of liraglutide (insulin degludec and liraglutide injection). You can inject doses from 10 to 50 units in a single injection (with each unit of insulin degludec, the pen also delivers 0.036 mg of liraglutide). The dose can be increased by 1 unit at a time. The dose equals the number of units shown in the dose counter. • a sharps container for throwing away used pens and needles. See “After your injection” at the end of these instructions. • Before you start to prepare your injection, check the XULTOPHY 100/3.6 pen label before each use to make sure it is your XULTOPHY 100/3.6 pen. • XULTOPHY 100/3.6 should look clear and colorless. Do not use XULTOPHY 100/3.6 if it is cloudy or colored. 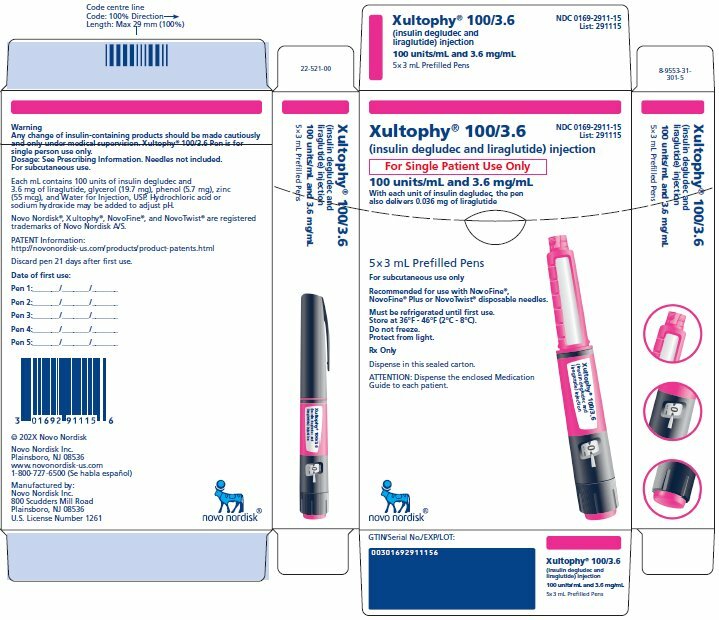 • Do not use XULTOPHY 100/3.6 past the expiration date printed on the label or 21 days after you start using the pen. • Always use a new needle for each injection to help ensure sterility and prevent blocked needles. Do not reuse or share needles with another person. You may give other people a serious infection or get a serious infection from them. 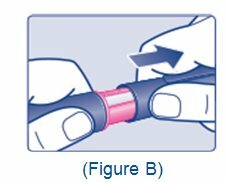 • Pull pen cap straight off (See Figure B). • Check the liquid in the pen (See Figure C). XULTOPHY 100/3.6 should look clear and colorless. Do not use it if it looks cloudy or colored. • Select a new needle. • Pull off the paper tab from the outer needle cap (See Figure D). • Push the capped needle straight onto the pen and twist the needle on until it is tight (See Figure E). 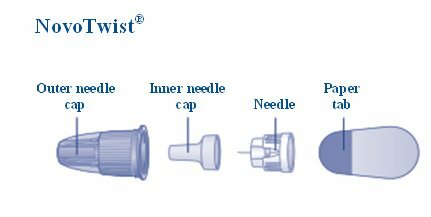 • Pull off the outer needle cap. Do not throw it away (See Figure F). • Pull off the inner needle cap and throw it away (See Figure G). • Turn the dose selector to select the priming symbol ( ). (See Figure H). • Hold the pen with the needle pointing up. Tap the top of the pen gently a few times to let any air bubbles rise to the top (See Figure I). • Hold the pen with the needle pointing up. Press and hold in the dose button until the dose counter shows “0”. The “0” must line up with the dose pointer. • A drop of XULTOPHY 100/3.6 should be seen at the needle tip (See Figure J). If you do not see a drop of XULTOPHY 100/3.6, repeat steps 7 to 9, no more than 6 times, until a drop of XULTOPHY 100/3.6 appears at the needle tip. If you still do not see a drop of XULTOPHY 100/3.6, change the needle and repeat steps 7 to 9. Selecting your dose: Make sure you prime your pen before setting your dose. XULTOPHY 100/3.6 pen is made to deliver the number of units that your healthcare provider prescribed.Take your dose exactly as your healthcare provider tells you to. Do not change your dosing schedule without first talking to your healthcare provider. • Turn the dose selector to select the dose you need to inject. The dose pointer should line up with your dose (See Figure K). • The XULTOPHY 100/3.6 pen scale will show you how much XULTOPHY 100/3.6 is left in your pen (See Figure L). Turn the dose selector until it stops. 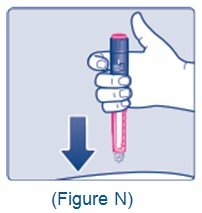 The dose counter will line up with the dose that is left in your pen. 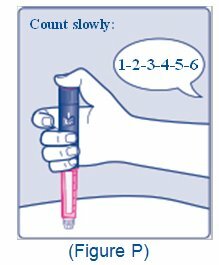 If the dose counter shows 50, there is a dose of at least 50 units left in your pen. If the dose counter shows between 10 and 50, the number shown in the dose counter is the total units left in your pen. If there is not enough XULTOPHY 100/3.6 left in your pen for a full dose, do not use it. Use a new XULTOPHY 100/3.6 pen. • Inject your XULTOPHY 100/3.6 exactly as your healthcare provider has shown you. Your healthcare provider should tell you if you need to pinch the skin before injecting. • XULTOPHY 100/3.6 can be injected under the skin (subcutaneously) of your stomach area (abdomen), upper legs (thighs) or upper arms. • Change (rotate) your injection sites within the area you choose for each dose. Do not use the same injection site for each injection. 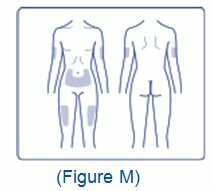 • Choose your injection site and wipe the skin with an alcohol swab (See Figure M). Let the injection site dry before you inject your dose. • Insert the needle into your skin (See Figure N). 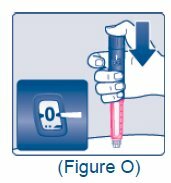 • Press and hold down the dose button until the dose counter shows “0” (See Figure O). The “0” must line up with the dose pointer. You may hear or feel a click. 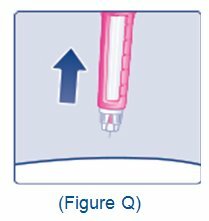 • Keep the needle in your skin after the dose counter has returned to “0” and slowly count to 6 (See Figure P). If the needle is removed before you count to 6, you may see a stream of XULTOPHY 100/3.6 coming from the needle tip. If you see a stream of XULTOPHY 100/3.6 coming from the needle tip you will not get your full dose. If this happens you should check your blood sugar levels more often because you may need more XULTOPHY 100/3.6. • Pull the needle out of your skin (See Figure Q). 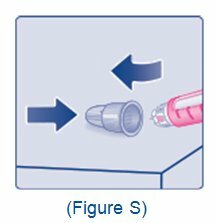 • Carefully remove the needle from the pen after each use and throw it away (See Figure R). Carefully slip the needle into the outer needle cap (See Figure S). Safely remove the needle and throw it away as soon as you can. 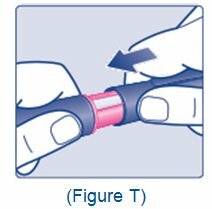 • Replace the pen cap by pushing it straight on (See Figure T). • Put your used XULTOPHY 100/3.6 pen and needles in a FDA-cleared sharps disposal container right away after use. Do not throw away (dispose of) loose needles and pens in your household trash. • When your sharps disposal container is almost full, you will need to follow your community guidelines for the right way to dispose of your sharps disposal container. There may be state or local laws about how you should throw away used needles and syringes. For more information about the safe sharps disposal, and for specific information about sharps disposal in the state that you live in, go to the FDA’s website at: http://www.fda.gov/safesharpsdisposal. • Do not dispose of your used sharps disposal container in your household trash unless your community guidelines permit this. Do not recycle your used sharps disposal container. How should I store my XULTOPHY 100/3.6 pen? • Store unused XULTOPHY 100/3.6 pens in the refrigerator at 36°F to 46°F (2°C to 8°C). • Do not freeze XULTOPHY 100/3.6. Do not use XULTOPHY 100/3.6 if it has been frozen. • Unused pens may be used until the expiration date printed on the label, if kept in the refrigerator. • If XULTOPHY 100/3.6 is stored outside of refrigeration prior to first use, it should be used or thrown away within 21 days. • Store the pens in the carton they come in to keep them clean and protected from light. • Store the pen you are currently using out of the refrigerator below 86°F (30°C) or in a refrigerator at 36°F to 46°F (2°C to 8°C). • Keep XULTOPHY 100/3.6 away from heat or light. • The XULTOPHY 100/3.6 pen you are using should be thrown away after 21 days, even if it still has XULTOPHY 100/3.6 left in it and the expiration date has not passed. • Keep XULTOPHY 100/3.6 pens and needles out of the reach of children. • Always use a new needle for each injection. 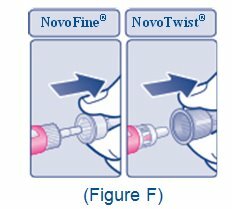 Novofine® Plus or NovoTwist® disposable needles. Must be refrigerated until first use. Store at 36°F – 46°F (2°C – 8°C).